Yesterday, we walked for a couple hours up into the right-bank neighborhood just south of the old Opera. 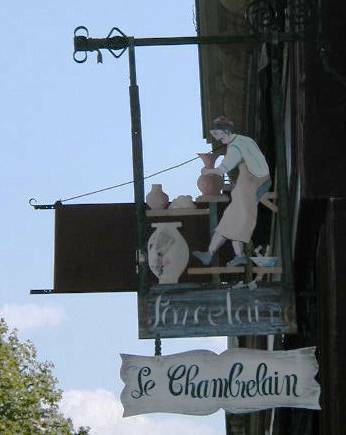 Rue du Commerce leads right to the Avenue de la Motte Piquet, where this cute sign (left) marks the front of a porcelain shop. 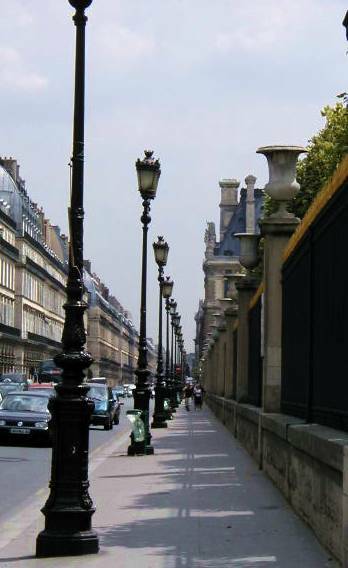 This avenue takes us right across the glorious space between Invalides and Pont Alexandre III (below). This park is called the Esplanade des Invalides. It is a favorite place for young men to play soccer, albeit illegally. The police, many of whom like to play soccer themselves, refuse to enforce the ban on soccer games in this park. Walking up the street along the right side of this space, we noticed a nice house with a foreign flag in front, signaling that it was probably an embassy. I went closer to inspect. 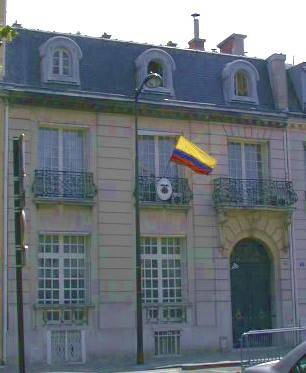 The Colombian embassy on the rue de Constantine, facing the Esplanade des Invalides in the 7th arrondisement of Paris. The building is in some disrepair. It was the Colombian embassy. Which reminds me, don't ever forget about Ingrid Betancourt, about whom I've written in prior years. She was kidnapped by the leftist rebels in Colombia and has been held by them for 501 days now. The Colombian government has been completely ineffective in gaining her release. Her husband recently expressed his displeasure by dumping a bucket of manure in front of the Colombian parliament. He was arrested for doing that. I don't think he was jailed, though. I read Ingrid's book, la rage au coeur (The Rage at the Heart). Ingrid Betancourt is a politician in Colombia who has consistently fought against corruption in the government there. She was educated at Science PO, the political science college at the University of Paris, and she spent a part of her childhood in Paris when her father worked for UNESCO and for the Colombian embassy. Her book was written in French, I think, and is available in Spanish and French. (Now available in English as Until Death do Us Part: My Struggle to Reclaim Columbia. ) After its publication in 2001, she was kidnapped in February 2002 by FARC, a Marxist Colombian terrorist group that is financed by the drug cartels. At the time she was running for president. Alvaro Uribe was elected instead. The terrorists have tried multiple times to kill him recently, and Ingrid remains their hostage. The book is gripping; highly recommended. 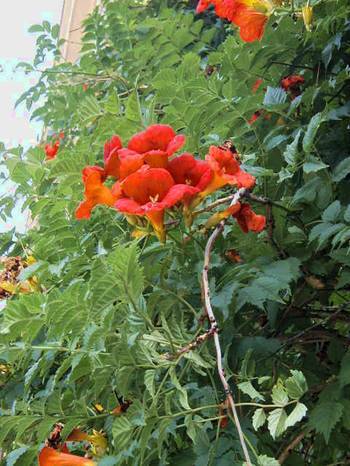 Flowering vine facing the Esplanade des Invalides. We took a right turn at the rue Saint Dominique and headed straight toward the Ministry of Defense, unwittingly. There were a number of people in uniform here and there, including some in camouflage fatigues with black berets, much like our daughter-in-law Crystal's Army Reserve uniform. While most French leaders and people seem to want to get along with the U.S. these days, the French Minister of Defense is another story. Her name is Michele Alliot-Marie. According to the International Herald Tribune on July 7 ("Notebook," by John Vinocur), she recently said that "American industry was operating with an 'economic war mentality' that required Europe to regroup and resist." She also said, "In a few years Mr. Rumsfeld will have opposite him a united Europe." She told another group about "the French goal of creating a Europe defined as a separate pole in opposition to the United States." If we leave Alliot-Marie and Rumsfeld in charge of things, it looks like we're headed for trouble. Somehow, I think cooler and more diplomatic heads will prevail. 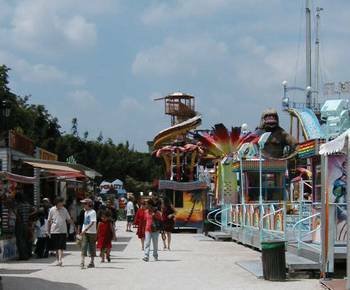 Better news, from Le Parisien on July 7: Plans are moving ahead for construction of a cross-town Tramway at the southern edge of Paris, going from the Pont du Gariglano in the 15th arrondisment to the Porte d'Ivry in the 13th arrondisment. Although many Parisians do not take public transportation, in polls they overwhelmingly indicate that improving and expanding public transport is a top priority for them. Entrance to the Palais Bourbon, home of the National Assembly. At the Place du Palais Bourbon, the Ministry of Defense was on our left, but I ignored it and instead took this photo (left) of the entry to the Palais, where the French National Assembly meets. 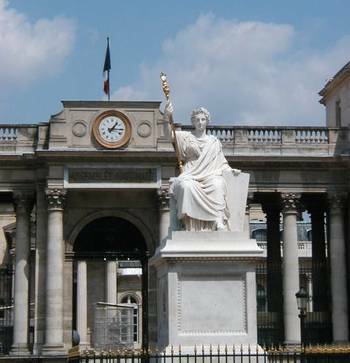 The National Assembly recently approved the proposed reforms in the French retirement system. Some of the unions are still protesting, but public opinion seems to be in favor of the reforms needed to make the system more fiscally possible. This palace was built from 1722 to 1728 for the Duchess of Bourbon, daughter of Louis XIV. We continued our trek in front of the Ministry of Defense, along the rue de l'Universit�, to the rue de Solferino. 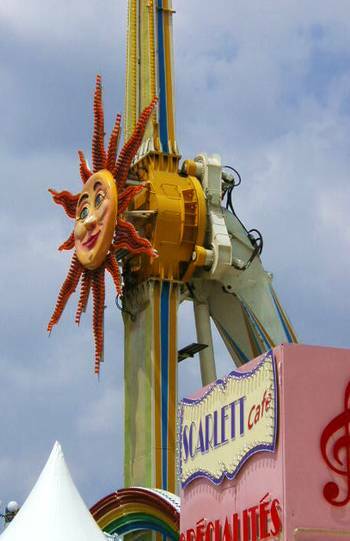 This brought us to the Passerelle de Solferino. We realized this is one of the more pleasant ways to cross the Seine. No cars. No deafening traffic. And at the right bank side, the bridge dips under the road so that one emerges right in the Tuileries! 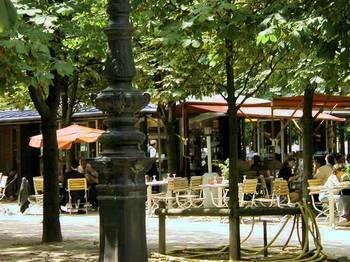 We stopped for drinks at the Cafe Renard, an outdoor cafe under large chestnut trees right in the middle of the Jardin des Tuileries (below). 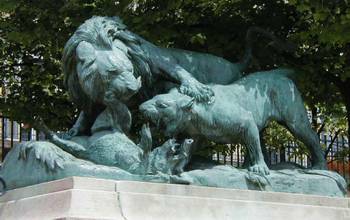 Lions eat a pig near the gate into the Tuileries from the rue de Castiglione. 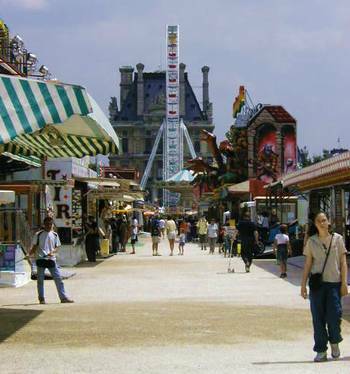 Fortified, we went on to the other side of the Tuileries where the new "foraine," or fairground, is located. The foraine was recently completely redone and reinstalled by a British contractor. The older foraine, which was meant to be temporary, was so popular that the bureaucrats decided to replace it with a newer, better one. 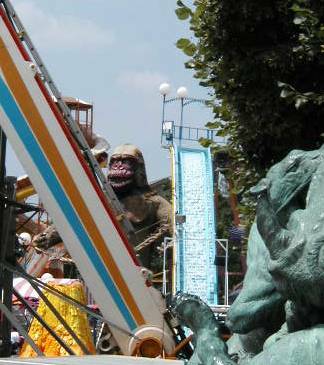 We emerged from the foraine of the Tuileries onto rue Rivoli, at the intersection of rue de Castiglione. The latter once was a road that ran alongside a Benedictine monasteries. From what I can tell, when Paris was small it must have been completely surrounded by monasteries and convents. I tried to find a watch I liked at the Swatch store on Place Vendome, as Tom had done last year. But no luck. I'll just have to keep shopping. Rue de Rivoli, a fun place to window-shop. We did buy things yesterday, however. We went to Brentano's, a large mostly-English language bookstore on the avenue de l'Opera. But all three books we bought were in French. I bought Raffarinades and Parlez Vous le Chirac? -- both books that have some fun with quotations from France's two top leaders. Tom bought a French dictionary, Le Robert Dictionnaire de la Langue Francaise Micro, a fat volume that will come in handy when we are trying to decipher the language in the two books that I bought, as well as that confounded newspaper, Le Figaro. Definition of "chef" : "Un chef, c'est pour cheffer!" "Je prefere etre assis chez moi que debout chez les autres." "Le chef d'enterprise sait dire le non, le politique prefere le oui." "Je suis un produit regional." "La prochaine planete ne sera pas notre heritage, mais notre creation." "La France est gouvernee par trois ou quatre arrondisements de Paris." "During the Revolution, the royal statue [of Louis XIV] was destroyed and in 1810, Napoleon erected the Austerlitz column at its centre. The column's stone core, 44m/132ft high, is encased in a bronze spiral cast from 1 250 canon [?] captured at the Battle of Austerlitz (1805), and decorated with military scenes in imitation of Trajan's column in Rome. 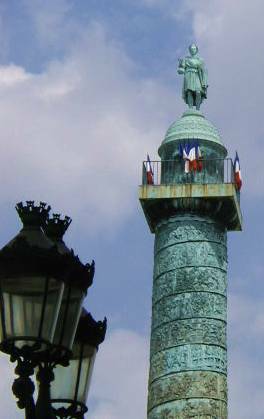 "The original statue mounted on the column was of Napoleon as Caesar; in 1814 it was replaced by one of Henri IV, removed for the 100 days (1815) when Napoleon attempted to regain power. Louis XVIII then had a colossal fleur-de-lis hoisted there; Louis-Phillippe re-established Napoleon, this time in military uniform, and Napoleon III substituted a replica of the original. The Commune tore down the column in 1871 -- an incident for which the painter Gustave Courbet was blamed and exiled." So, now we see Napoleon as Caesar at the top of the column, left. 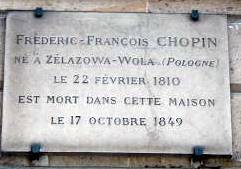 Did you know that Chopin died in a house on the Place Vendome? 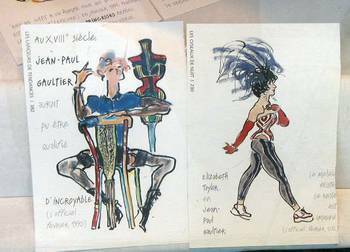 <Previous Next> Near the Place Vendome, I found a lovely little fabric shop with a big display of these cartoons in the window. 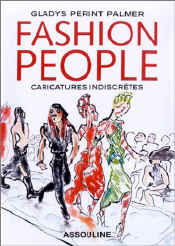 They are from a book called Fashion People: caricatures indescretes by Gladys Perint Palmer.